Captain Barry's exploits include setting up logistics in areas impacted by natural disasters. He is a disaster relief volunteer for the American Red Cross and other non-governmental organizations (NGO). He also volunteers locally on Chincoteague Island and most recently returned from Lumberton NC where Hurricane Matthew did the most damage. Baltimore Magazine says this: "The Tour: This isn’t a sit-back-and-relax boat ride. On a trip with Captain Barry Frishman, you can expect to get dirt on your hands and mud between your toes. Frishman, who has been called the “Indiana Jones of the Chincoteague,” is on a mission to expose people—both kids and adults—to nature as closely as possible. That means docking his pontoon boat on sandbars and digging for clams, foraging for snails and hermit crabs, and learning how to shuck—and slurp—an oyster. “There’s a whole generation of kids growing up on laptops,” he says with despair. “I like to get people out of their comfort zones. 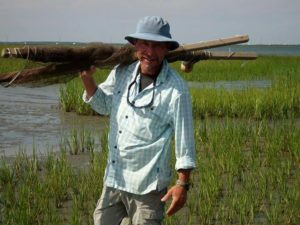 I like to blow minds.” Your Guide: Frishman, who has been operating these tours for more than 25 years, is a whirlwind of energy and an encyclopedia of Chincoteague wildlife. He keeps the tours limited to six, so he can “crawl around on his hands and knees” with every passenger." Captain Barry is also an accomplished artist. © 2019 Captain Barry's Backbay Cruises. All Rights Reserved.